The Summer House is a unique setting. You are not required to use our vendors, however, we have a preferred vendor list should you want their assistance. Small events can be held indoors. Larger events can be held outdoors in the open air or with tents from vendors available in the immediate area. There are several options to make your event a success. Come tour the property and let us help you plan your gathering. Our daughter and future son-in-law chose this venue because of its intimacy and rustic charm. The venue is beautiful; the atmosphere comfortable, romantic, and very relaxing. Recently, we had our first meeting where we met the owner, Lisa. She proved to be the most accommodating, helpful, and personable person we have ever met. She went out of their way to show us each and every detail that makes The Summer House such a wonderful place to have any type of event. Her excitement is so contagious! We can hardly wait till May!. Thanks, Lisa - we know our precious bride and groom are in good hands. Amazing! We had been searching for a place that was close to Maysville and Lexington, a halfway place. We found it! We wanted a romantic rustic vintage wedding that was both elegant and welcoming to our guest. We found it! It was super easy to find for our guest. The owner was super helpful and did EVERYTHING to make our day perfect! Our caterers even raved about how beautiful and perfect this venue is. I would recommend this place to anyone for there special event!!!!!!! I recently just did a wedding at the Summer House Venue and it was beyond what we expected. Speaking from a wedding planners perspective I couldnt have asked for a better spot for my couples special day. Lisa the venues owner was so easy and flexible to work with and just a genuinely lovable personality. The venue is beautifully kept and the small details were never overlooked. She has an in house florist which is very helpful as well as tables and chairs. I fell in love with the venue the first time i saw it but on the wedding day with all the lights all lit and chairs in place in front of the handmade perigola made me fall in love with it all over again. I highly recommend this venue and can not wait to have another couples wedding here. Looking forward to working with you again! Thank you for the kind words. Attended a gathering on an inclement Jan evening, but the beautiful decor, cozy, welcoming ambiance and warm, roaring fire in the stone fireplace made all that bad weather seem to disappear! Lisa did a wonderful job of making everyone feel welcome and at home...cannot think of a better place to hold an event or kinder person to work with! Attended an event on an inclement January night, but the beautiful decor, cozy feel and warm, roaring fire in the stone fireplace made all the bad weather seem to disappear! Can't think of a better place to hold and event (bet it is super in the summer!) or a sweeter hostess than Lisa! This couple is obviously still very much in love after 12 years of marriage. It was our pleasure to assist this military family and have the opportunity to meet their family and friends. What a treat it was for us to host this event for them. Best wishes to Aminda and Brian for a lifetime of happiness to come. This charming venue is a treasure ! The Summer House is PERFECT for a party to celebrate any occasion. We attended a community gathering there to welcome new folks to our community and everyone felt "at home" right away. The hosts had a fire in the beautiful fire place for ambiance and it provided the perfect setting to sit on the comfy sofas to visit. There was ample room for a dessert buffet and plenty of space for people to mingle. I would highly recommend the Summer House Venue for a bridal shower or birthday party too! I can't wait to go back in the spring to see the beautiful yard , with the tree swing, and help my friend plan her summer wedding here. Thank you so much. What a lovely review. This is a beautiful, unique venue. It met the needs of our family get together and birthday party. The setting is beautiful, as you can see from the pictures on the website. I think The Summer House will make a great destination for a variety of occasions. I appreciated the true Kentucky Bluegrass setting and quaint Summer House, which would have been just as welcoming in any other season! 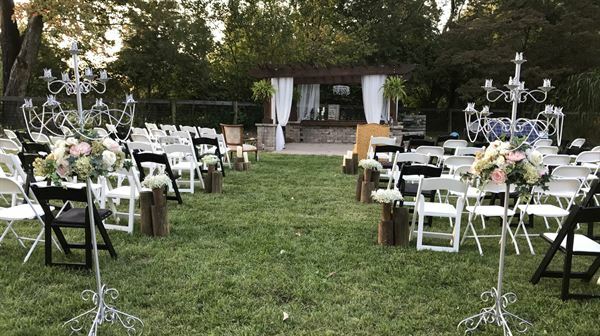 Answer to your questions about where to hold an event, celebration, Bridge Party, or wedding, Just 30 minutes from Lexington on historic Simon Kenton Highway, US 68. Lisa will work with you a to create the most special event at the Summer House Venue!! Check it out!! Special Features: Our larger events are held outdoors while the food is staged within The Summer House. If you are having an intimate event of 50 or fewer, you may choose to hold everything inside. We allow tents and try to be flexible so the event matches your vision.